Back in the olden days, most typists were trained to use all their fingers. That’s less of a concern now, leading to all sorts of self-taught typing styles. But as a new study shows, our lack of formal training — and our resistance to using all ten fingers — doesn’t mean we’re not proficient typists. Related: Is the Art of Typing Becoming Lost in a World of Touchscreens and Social Media? I cringe every time I have to watch my teenage son type. Unlike his father, who still dutifully sets his eight fingers on the home row, this child of the digital era uses his two measly index fingers to type. Incredibly, however, it works for him; his fingers fly across the keyboard quickly and accurately. A new study from Aalto University supports this observation, suggesting it’s not the number of fingers that matters when typing, but how we use them. Feit’s team recruited 30 volunteers of various ages and typing skills, and then recorded their individual styles with an optical motion capture system. A dozen high-speed infrared cameras tracked 52 reflective markers placed on the participants’ hands and fingers. 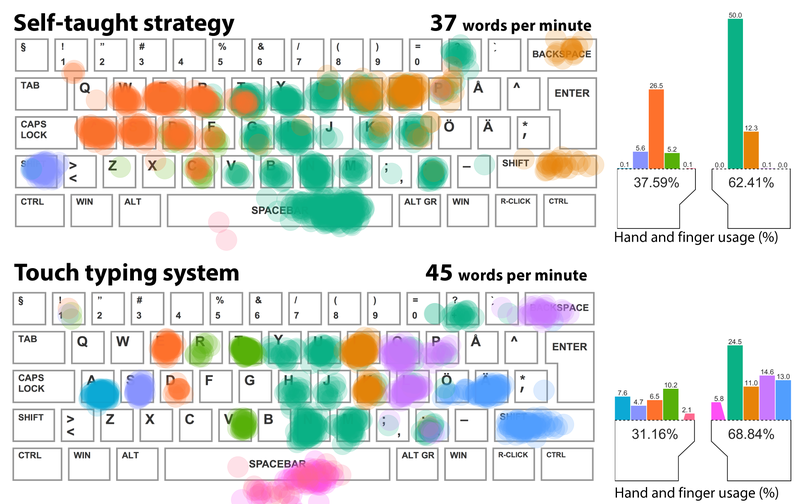 This allowed the researchers to to measure the speed and accuracy of their individual typing styles. 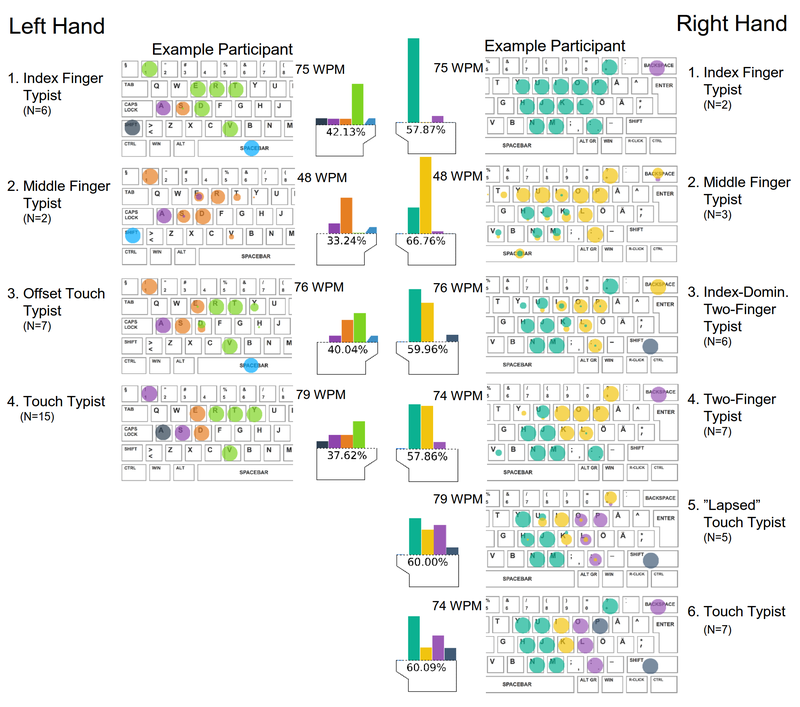 And to get a visual sense of typing commonalities, the researchers created finger-to-key maps. Fast typists, touch vs. self taught. 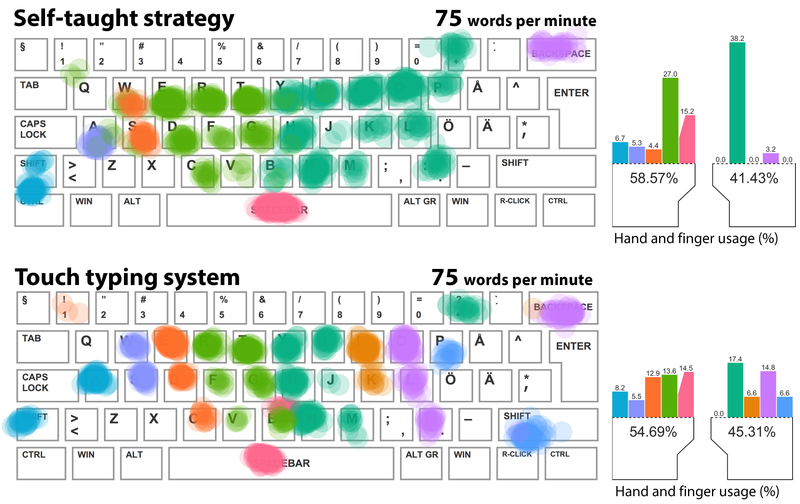 Analysis revealed that most participants used their left and right hands differently; some kept their left hands at the same place over the keyboard while their right hand moved from side-to-side, and vice-versa. Four groups of typists performed these similar movements with their left hand, and six groups with their right hand. The volunteers used anywhere from one to two fingers per hand right (i.e. “hunt-and-peck”) to all five. Some exhibited unique typing behaviors, like using the Caps Lock instead of shift, or using both thumbs together to hit the spacebar. Common strategies for each hand. Regardless of the style, however, the volunteers typed at different rates, some fast, some slow. This suggests that other factors are at play. For example, fast typists kept their hands on one position instead of moving them over the keyboard. They also used the same finger for the same letter virtually every time. The researchers also observed that untrained typists spent about twice as much time gazing at their fingers instead of the screen, which affected their ability to do complex editing tasks.